Session 21: Creams and Custards was pretty fun. Such lovely things come from combining eggs, milk, cream and sugar. My first demonstration was Crème Pâtissière (Pastry Cream) which is a starch-bound custard, and one that I had made in the last session (part of the almond cream and the éclairs). It isn't usually served on it's own, but as a filling. (But, I for one wouldn't be opposed to eating it straight from the bowl.) First, I sifted equal amounts of flour and cornstarch together in a medium bowl (you can also use all flour or all cornstarch; the former would give a starchier taste, the latter a lighter taste). Then, I heated some whole milk and half of a vanilla bean (scraped and seeds reserved) in a pot on the stove until it came to a boil. Once it did, I quickly removed it from the heat and let it cool for a minute or so. In the meantime, I combined sugar and four egg yolks (at room temperature) in a small bowl and whisked until the mixture was pale yellow (blanchir), which took a bit of elbow grease. 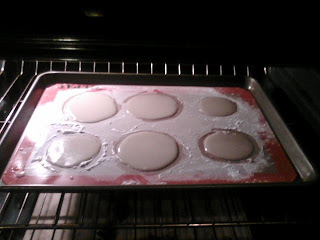 Then, I stirred in the cornstarch/flour mixture and whisked it all together until it was smooth. I poured half of the hot milk into the bowl with the egg/starch/sugar mixture, whisking the whole time. This tempers the mixture and keeps it from breaking/curdling the eggs. Once that was incorporated, I returned the mixture back to the pot with the other half of the hot milk. Whisking constantly (my wrist/arm is sore! ), I brought this to a boil, scraping the sides to prevent sticky lumps, and then lowered the heat a bit and cooked for about 3-5 minutes, until thick. When it was thick, I removed the pan from the heat, transferred the custard to a bowl, removed the vanilla bean pod and that was it! I covered the top with plastic wrap to prevent a skin from forming, then put in the fridge for later use. Next was Crème Anglaise (Custard Cream), which is a stirred custard and is, according to the book "the classic French dessert sauce." It is prepared pretty much in the same way as the pastry cream, except there is no flour/cornstarch mixture in the recipe, there are 5 eggs instead of 4, and when you return the tempered egg/sugar/milk mixture back into the other half of the hot milk, instead of cooking for 3 minutes, it needs to cook about four times as long. I cooked it for about 12-15 minutes, until the custard coated the back of a spoon and it left a line when I dragged my finger through it. When it was ready, I had to pasteurize the cream by heating it to 175 degrees (via a candy thermometer) and then holding it there, stirring for 5 minutes and not letting it exceed 180 degrees, which would cause it to curdle. After that, I removed it from the heat, poured it through my trusty chinois and covered with plastic wrap until I needed it for a recipe. After that, I moved on to a favorite custard dessert -- Crème Caramel (Caramel Custard). First, I had to make the caramel. I combined about 7 oz of sugar with 3.5 TBS of water in a stainless steel pan and brought to a boil over medium heat. When the syrup started to cook and splash the sides of the pan, I dipped a pastry brush in water and brushed the crystals back down into the pan. After several minutes, the sugar started to turn a light brown, golden color. I turned the pan a few times to keep the color even, and when I had a lovely golden brown, I removed it from the heat. (To test the color, the book recommends putting a bit of the caramel on a heatproof plate and rubbing with an ice cube to stop the cooking. If the color you want is on the plate -- you're done. If not, put it back on the heat.) One note -- do not touch the caramel -- silly Gourmess dipped her finger into the spoon and scalded the heck out of herself. Ouchers. I poured a thin layer of the caramel into the bottom of four clean ramekins that I had cleaned and dried, and had placed on a baking sheet lined with parchment paper. Then, I made the custard (milk/vanilla bean half in a pan, bring to boil, remove from heat. Whisk 3 eggs/sugar in a bowl until pale yellow, whisk in half the milk, then slowly pour back into the pan, cook to combine, pour through a chinois and skim off any foam that forms on the surface). The custard then went into the ramekins on top of the caramel and I put the sheet pan in the oven, carefully adding in boiling water until it came halfway up the sides of the ramekins. I baked the custard for about 40 minutes at 325 degrees until it didn't jiggle when I tapped the ramekins, then removed from the oven and immediately put in an ice water bath to chill. Since this dish is traditionally always served cold, I put it in the fridge until it was time to enjoy. To serve, I carefully ran a paring knife around the inside of the ramekin and then inverted it onto a small dish. I did it correctly, so the caramel layered the top and ran down the sides -- but my first one wasn't a perfect circle as I was a bit over eager with the knife. Still looks pretty tasty. I baked the cookies in a 350 degree oven for about 15 minutes, until they were golden brown, rotating the pan every few minutes for even color. When done, I removed from the oven and then gently but quickly lifted the cookies up one at a time and wrapped each round the end of a wooden spoon, into a cigarette shape, rolling the end completely and keeping the top of the cookie as the outside of the tuille (mine were more like cigars, but same difference). Crispy and sweet, and a nice treat to go with the custard pots. Yum. 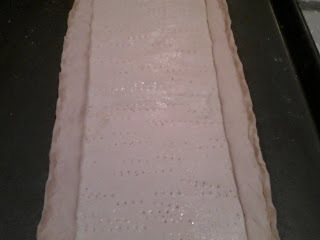 After the dough was well chilled, I sprinkled a baking sheet with cold water to prevent sticking and put the chilled pastry on top. I brushed the pastry again with the egg wash and then baked in a 375 degree oven (that was preheated to 400 and turned down) for about 15 minutes until the dough was golden brown and starting to rise. )The book says if it browns too quickly, to lower the heat to 350 degrees.) Once the pastry turned golden, I turned the oven down again (325-350 degrees) and baked for another 15 minutes until it had risen a bit more and was brown and crisp. I would have liked mine to have risen higher than it did, but for all the trouble I had making it (due to the heat and humidity), I think it came out pretty well for the first try. I made my apricot glaze (from the previous session on tarts) and using a rounded spatula, spread pastry cream over the base, being careful not to get it on the edges. Then, I decorated with lightly poached local July fruits -- strawberries, blueberries and peaches, before gently coating it with the apricot glaze. It was flaky and sweet and creamy and fresh -- the perfect summer treat. 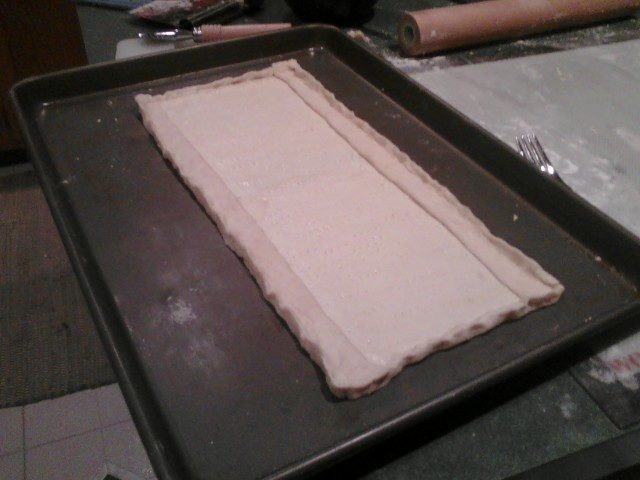 Definitely worth all the puff pastry trouble.